Shoulders like cannonballs? Pecs like a body builder? Triceps like horseshoes? Our Soozier Dip Station is built to last for years, made of high quality 2" x 2" steel, making it ideal for home and commercial use. If you are looking to build awesome shoulders, thicker pecs, and killer triceps, this is the perfect Dip Station. 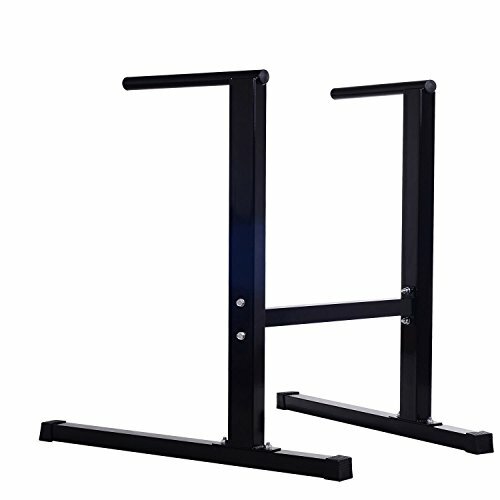 Getting its stability from the wide and extended base that eliminates rocking, this upper body developer with sturdy bars and slip-proof rubber caps on the end can provide excellent comfort and functionality. With 2 PP caps on the end of bar & 4 rubber caps on the base • Mainframe constructed by high-quality Q 195 Steel tube.